Debdulal Saha is Assistant Professor at Tata Institute of Social Sciences (TISS), Guwahati Campus. Prior to join TISS, he was post-doctoral fellow and guest lecturer at the International Center for Development and Decent Work (ICDD), University of Kassel, Germany. He obtained MA in Economics from the University of North Bengal and Ph.D from TISS Mumbai. His areas of teaching and research include work and employment, informal economy, labour and development, and industrial organisation. Debdulal Saha is Assistant Professor at Tata Institute of Social Sciences (TISS), Guwahati Campus. Prior to join TISS, he was post-doctoral fellow and guest lecturer at the International Center for Development and Decent Work (ICDD), University of Kassel, Germany. He obtained MA in Economics from the University of North Bengal and Ph.D from TISS Mumbai. During his Ph.D., he was doctoral fellow at ICDD, University of Kassel, Germany which was funded by German Academic Exchange Services (DAAD). 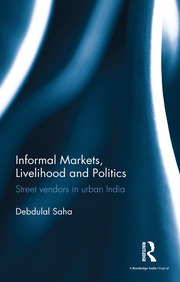 He is author of Informal Markets, Livelihood and Politics: Street Vendors in Urban India (Routledge, 2016), co-author of Financial Inclusion of the Marginalised: Street Vendors in Urban Economy (Springer, 2013) and co-editor of Food Crisis and its Implication on Labour (Rainer Hampp Verlag, 2013). Besides, he has published several articles in both international and national peer reviewed journals and chapters in edited books on informal economy, inequality, poverty and social policies. He was engaged as research coordinator in major projects on street vendors supported by United Nations Development Programmes (UNDP), Ministry of Housing and Poverty Alleviation (MoHUPA), National Alliance for Street Vendors in India (NASVI) and Municipal Corporation for Greater Mumbai (MCGM). He was also appointed as key researcher by Hans Böckler Foundation-Germany, International Labour Organisation (ILO) and Indo-Global Society for Social Services (IGSSS) on several research projects concerning inequality, labour and urban poverty.